Rocky Raccoon Hoist Upon His Petard! 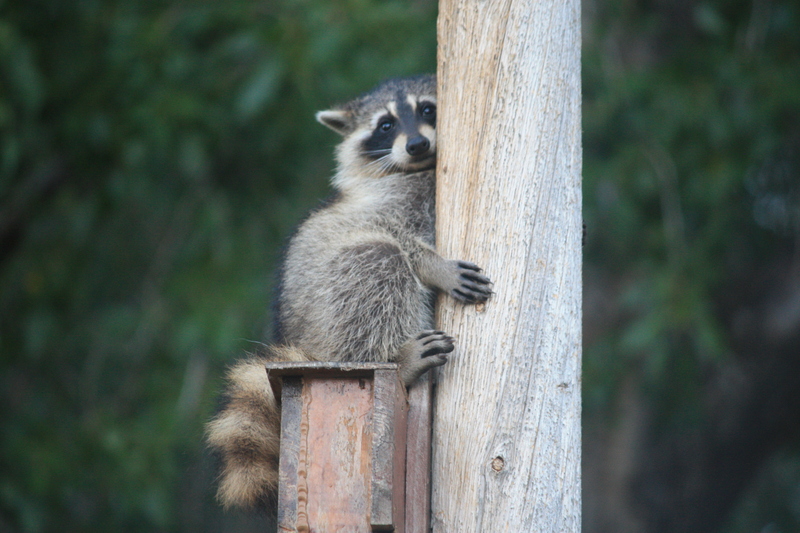 Rocky is grateful for the bat house installed on a telephone pole where he is seated above. It gives him a ledge to rest upon and think about his bad decision to venture into a “people place” with a dog. This young one probably has a mother and siblings in the area, but it seems he is on a lone journey into the unknown. First the dog started barking, and then the kittens showed interest and gathered beneath the pole, peering up intently at this unfortunate little bundle. What they don’t realize is just how tough this quivering, frightened little creature can be if called upon to defend himself. He lowered himself a couple of times, trying to build up the courage to make a run for it but, much to my relief, thought better of it and scooted back up the pole to his perch. I could imagine the vet bills if Rosie, Oscar and TuTu descended upon the little varmint enmasse. With that thought in mind, I took off for the barn to feed Tilly, knowing the dog and kittens would follow me. I had to call them a couple times as they were reluctant to leave this curiosity behind, but they finally joined me, leaving Rocky to climb down and make his getaway (I hoped). When we returned, Rocky was gone. Rosie followed the scent a short distance and gave up the pursuit. Now let’s hope I didn’t save little Rocky only to find him making a raid in my chicken house!